We are pleased to be able to offer you the chance to own copies of our deep-sky images. The images that you purchase will be produced with the same skill and to the same level of quality that we used to produce the images for all our exhibitions – please check the “Exhibitions” category to see where the NFO has exhibited deep-sky images. The large framed images look absolutely stunning in the modern home, the (high-tech) corporate office, the Board room, Hotel reception areas, and Conference venues. 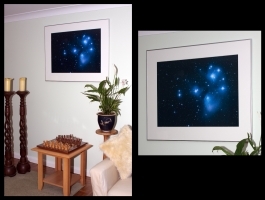 NFO framed images are on customers’ walls as far separated as Australia, Saudi Arabia, Seattle and Sri Lanka! For the Large prints the height is 23″ but the width may vary according to the subject. Typically the width is 32″. For medium prints the height is 18.5″ and again the width may vary according to the subject, but it is typically 25″. If you would like a smaller or custom print size other than those shown above then please contact us as we are happy to discuss any printing requirements you might have. Hyperstar Single Frame as referred to above is for the original Hyperstar unit (the one that was used with the small SXV-H9C camera). Prints in Large, Medium and Custom sizes are all supported by single frame images from the Hyperstar III and SXVF-M25C camera. The final size of individual prints may vary slightly from the above dimensions depending on the image. By this we mean that we will reduce the final printed size of the image to get the best possible combination of size and quality. Please note: All A1, A2, and two-frame prints, whether framed or not are signed, dated and numbered with a print run limit of 250 prints. A3 and A4 prints are signed and year dated but there is no print run limit for these sizes. Professionally-framed prints of all the images on this site are also available. The 100 cm x 80 cm Aluminium frame accepts both Large and Medium prints and incorporates a U.V. absorbing protective glass, an 80cm x 80cm frame is used for the two-frame prints. All Large, Medium, and two-frame prints are signed, dated and numbered with a U.K. print run limit of 250. Please note there is no print run limit for A3 or A4 prints and these are signed and year dated only. Custom sized framed prints are available in the U.K. signed by Greg Parker but they will not be part of a numbered run. If you require a custom size framed image then please contact us. Large and medium prints are printed on photo-quality satin-finished 200 g.s.m paper using 6-colour fade-resistant ink [Hewlett-Packard] processing. Unframed Prints are delivered in an impact-resistant cardboard tube together with an information sheet detailing the image you have purchased. Framed Prints may be delivered by special Courier within the U.K. at extra cost – please contact us for a quotation on delivery. You are welcome to visit the New Forest Observatory to collect your framed print personally. Large print [A1]: £145 inclusive of U.K. p&p- check pricing through sales for framed and custom size prints. Two-frame print: £155 inclusive of U.K. p&p – check pricing through sales for framed and custom size prints. Medium print [A2]: £90 inclusive of U.K. p&p – check pricing through sales for framed and custom size prints. A3 prints are printed on 250 g/m2 Hewlett-Packard photo glossy paper and are available unframed at only £50.00 per print inclusive of U.K. p&p! A4 prints are printed on 240 g/m2 Hewlett-Packard Photo Premium Glossy paper and are available unframed at only £25.00 per print inclusive of U.K. p&p! For framed prints we can also supply “Museum-grade” glass in the frames with higher U.V. absorption and added anti-reflection coating. If you think that this is something you are interested in please contact us through sales. 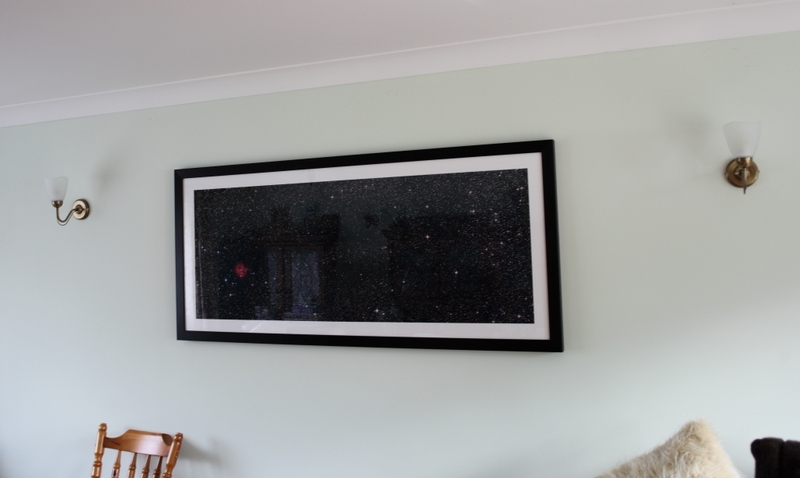 The Ultra Wide Field Cocoon image is available as a framed print in a custom black wooden frame for just £1025. 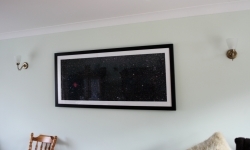 The size of the black frame in this image is 65 inches in width and 29.5 inches in height (165 cm x 75 cm). This image is limited to 50 framed prints only! Check with sales for the price of packing and posting this item if you are unable to personally collect from the New Forest Observatory. Please note – only 50 framed prints of this image will be available – this is an investment artwork and it is not available unframed. Please ask for a separate quotation for this framed print if you want Museum grade glass to be used. Email us at greg@newforestobservatory.com for further information.